An invasion of pests is posing a threat to a particular species of trees in Ark La Tex. Northern Webster parish is on the front line in the attack of the Emerald Ash Borer. This invasive pest originated in China and has spread from the northeastern United States to Arkansas and Louisiana. As the name implies the pest attacks only Ash trees. Pesticides kill the insect but that method is expensive. So entomologists are taking a bio friendly approach to stem the invasion. Wood Johnson of the U.S. Forestry Service says "We hope to slow the progress of the Emerald Ash Borer. And it's thought on the southern edge of the Emerald Ash Borer invasion such as Louisiana and southern Arkansas where population is still small bio control efforts will have a greater effect." Bio control means using a special species of wasp to attack the larvae of the Emerald Ash Borer. Dr. Rodrigo Diaz of the LSU Agriculture Center explains "So there are the bolts are actually carrying the Emerald Ash Borer larvae. The parasitoids were placed in them months ago and we are going to place them in the field. Also there are tiny wasps. These wasps actually females that lay tiny eggs on the Emerald Ash Borer larvae that are on the Ash trees that we have here. The whole purpose of the female is to lay her eggs on the larvae of the Emerald Ash Borer. The wasps and the parasitoids as they are called feed on the ash borer larvae and keep the larvae from thriving and becoming adults that produce more off spring that mature and feed on Ash trees and result in killing the tree. These wasps are a natural predator to the Ash Borer. They are also pest control that was developed in China and shared with the United States. Therefore, doing nothing will result in the Emerald Ash Borer chewing on more and more Ash trees until that species of trees is wiped out. Now it should be pointed out that officials don't view this effort as a one and done magic bullet. 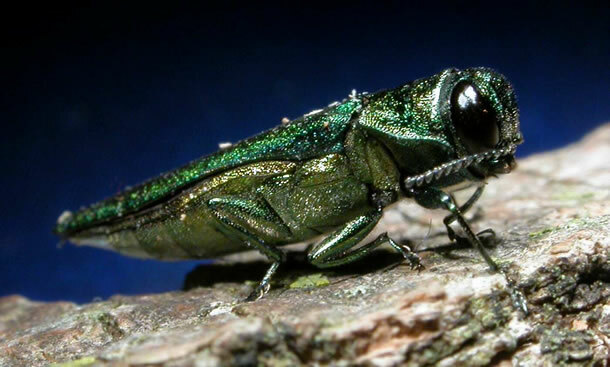 The LSU Ag Center, U.S. Forestry Service and the Louisiana Department of Agriculture and Forestry are working in combination to stem the invasions of the Emerald Ash Borer. If you see an area that's being affected be sure to call the LSU Agriculture Center.